At Delfi Technologies, we have dedicated Android developers who are specialists in designing and developing Android software solutions for the retail, warehouse, logistics and healthcare industry. Our typical customers need an Android App to handle work tasks like stock count, reorder, inbound & outbound delivery of goods, consumption of goods, create order, etc. We offer Android solutions that cover the most common work tasks, but we have also delivered a wide range of customized software solutions that cover specific needs in the market. Where can an Android solution be used? Need to use your Android device for RFID purposes? RFID can be used to track items e.g. in your warehouse, under production, on clothing or in the food industry. A Delfi Service Agreement keeps you running when a unit is down, so you can minimize downtime in order to ensure continued ability to provide control and process sales. Control your Android devices centrally with SOTI - a proven innovator and industry leader for mobility and IoT management, regardless if the device is a PDA, phone or computer. Do you need an Android device? At Delfi Technologies, we offer a wide range of Android devices – all with different features depending on purpose and industry. One of our most popular Android devices is the Delfi PM80. 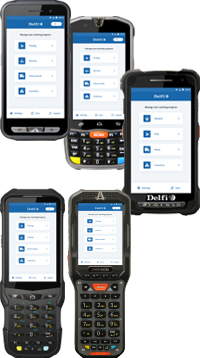 With advanced scanning technology, the Delfi PM80 delivers a lighting speed 2D barcode scanning. Whether the barcode is poorly printed, destroyed, stained, placed high or low on a shelf, you can still expect a reliable scanning performance. With Qualcomm Snapdragon 1.4GHz quad-core mobile processor, Delfi PM80 enables you to make unbelievable performances possible: reliable and crystal-clear voice calls, a superior internet connection and the battery efficiency including fast charging and long life.